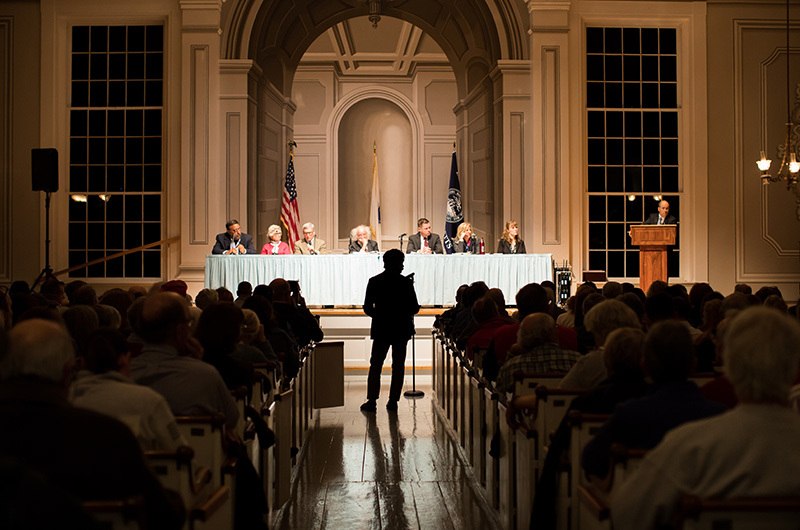 In a long and often emotional evening, Edgartown voters powered through a 95-article town meeting Tuesday that saw the defeat of two housing bank measures, the approval of a new hangar at the Katama Airfield, and nearly $1 million in funding for renovations to the Morse street dock. And while the meeting didn’t finish until well after the bell tower in the Old Whaling Church tolled the 11 p.m. chimes and the quorum had dwindled to a bare minimum, in nearly five hours a new moderator, town clerk and town administrator were able to usher through a $38.2 million budget and millions more in appropriations. The night began with its usual pomp, as sixth-grader Kathleen DaSilva led the town’s 258 voters in the pledge of allegiance. 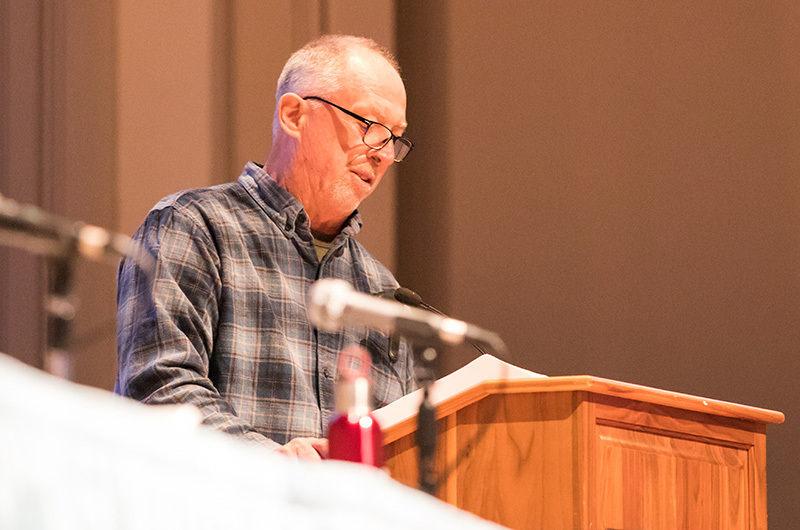 Town poet laureate Steve Ewing honored former selectman Ted Morgan, who had died two days prior, with a few stanzas of tear-choked verse. Mr. Ewing said he included the last line because Ted Morgan used to say he didn’t want to be buried on Martha’s Vineyard ­he wanted to be buried in Edgartown. A moment of silence followed for Mr. Morgan. The quietude didn’t last long. Fierce debate quickly flared over two early articles on the special town meeting warrant to enact and fund an Islandwide housing bank. The proposal would create a bank using funds from a newly enacted rental tax to support year-round housing. Mr. Ewing spoke in favor of the bank, saying that in light of the Island’s long history, the housing bank had become a modern necessity. Others who spoke in favor of the bank included Dean Rosenthal and Victoria Haeselbarth. Both said it was crucial to immediately earmark a portion of the short-term rental tax for affordable housing, despite opposition from selectmen. After hearing from more proponents, skeptics rose to question town officials about the logistics of the proposed legislation. Paulo De Oliviera, who is the elected Register of Deeds and a member of the town finance committee, explained why the committee had voted to not recommend the warrant articles, saying it would be unwise for the town to commit to funding a measure without knowing the full extent of the short-term rental tax revenue stream. “Overall, we just need a little more time to see what this rental tax number would represent,” Mr. De Oliviera said. “It’s not about the goal [to create more housing opportunities], it’s about the mechanism that was presented to us,” he said. Town counsel Ron Rappaport spoke at length, outlining numerous legal concerns with the bill and the way it is worded, including a lack of definition of year-round housing, confusing language and internal inconsistencies. 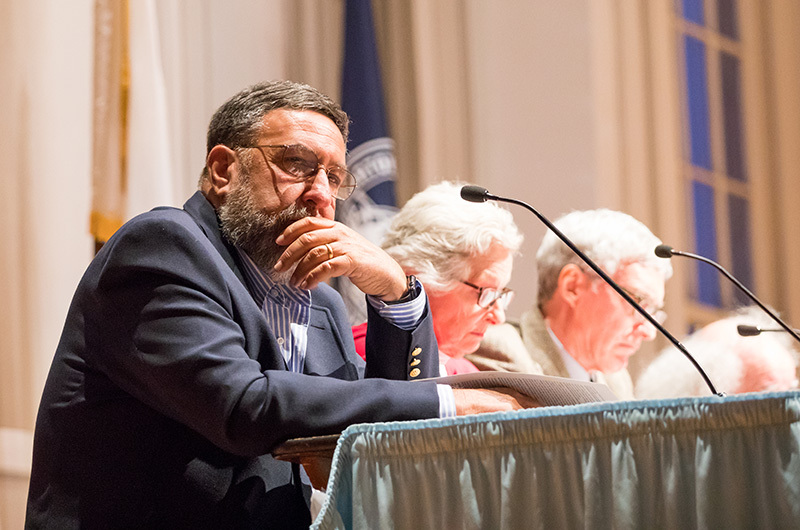 Selectman Michael Donaroma moved to indefinitely postpone the first article (enacting the housing bank) with a condition that housing bank proponents and town officials work together and hold public hearings before the next annual town meeting. Although the discussion continued for another hour, Mr. Donaroma’s motion ultimately passed 208-64. A second article concerning a funding mechanism for the housing bank was quickly defeated on a voice vote. 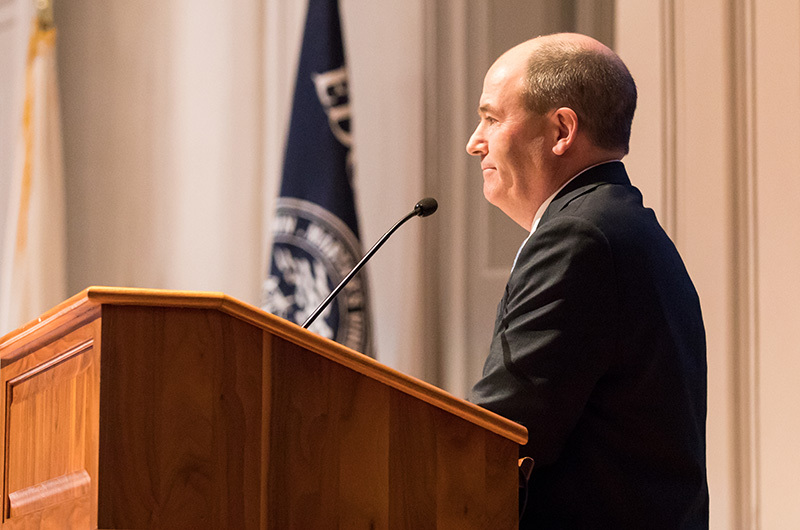 Moderator Sean Murphy then pushed the meeting forward at it characteristic rapid-fire pace, rattling off unanimous votes in favor of spending measures that ranged from dehumidifying the Edgartown School to new public safety vehicles. Voters unanimously approved a $38.2 million operating budget with little discussion, and also green-lighted nearly $800,000 in community preservation funds for new tennis and pickleball courts at the town’s Robinson Road facility. The meeting hit a snag when Edgartown resident and attorney Benjamin Hall Jr. moved to indefinitely postpone an article that would allow the town to sell small unbuildable parcels of land to abutters. Mr. Hall wanted the town to give the land to the parks department. The motion failed and the article passed 193-4. Voters quickly approved over $300,000 in excess and deficiency funds to go toward plans for a renovation of the regional high school, as well as $900,000 for the restoration of the bulkhead and wooden walkways at the Morse street dock. An article to appropriate $950,000 to engineer, demolish and expand the historic Katama Airfield hangar drew passionate debate. The measure had come before town voters last year, passing at town meeting but ultimately failing by one vote at the ballot box. This year, a similar conversation occurred on town meeting floor, with proponents citing the unique history of the airfield and critics suggesting that the money could be put to better use elsewhere. Proponents felt that regardless of who used the planes, it was important for the town to preserve the airfield and its essential components, including the hangar. The article passed 157-56, achieving a needed two-thirds majority. It still needed approval in the ballot box Thursday. “All right, let’s get flying now,” moderator Sean Murphy said. Voters then sped through the rest of the warrant, including a zoning board bylaw that allows for Edgartown to regulate potential marijuana establishments. Mr. Hall did propose an amendment to a warrant article that added a definition of common driveway, requesting to strike the definition on the grounds that it could create potential legal loopholes. Voters agreed, approving the amended article by a voice vote. Voters rejected a home rule petition request that would allow the board of health to have more control over herbicide use in town. The petition has been approved in other towns, but town health agent Matt Poole (who is not an Edgartown voter) spoke against it. He said the board of health is not qualified to regulate herbicides, and that the bylaw as written would cause more problems than it would solve. 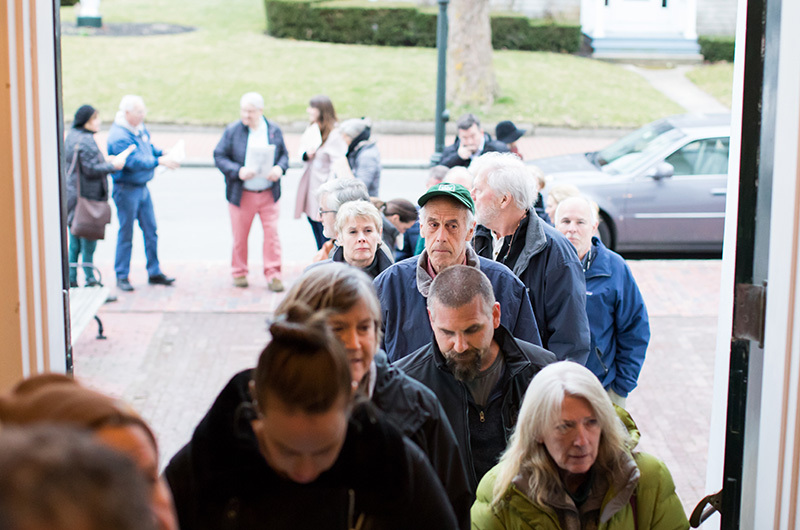 As the meeting came to a close and became perilously close to losing the needed 188-voter quorum, town constables stood at the doors urging voters to remain in their seats. Most grudgingly obliged, staying up well past their bedtimes to allow the town to finish its hefty warrant in a single haul. “Long night, but we got through it,” Mr. Murphy said. Now that the housing bank has been defeated can we start the conversation about how the rental tax income can be used to alleviate property tax burdens. With the additional revenue there is not excuse for unwarranted increases in property taxes this fiscal year. Yes to Mark’s point. Then we need to implement a 35% residential exemption. That would make a real difference. Be thankful for the generous summer residents who subsidize the locals with tax payments, and cheerfully GROSSLY overpaying for average goods and services from the local businesses.. Do you really think the 'Tisbury model' of favoring locals would do anything but create divisions and animosity. I'll tell you what. If you do push for that socialist exemption, I'll be sure to have my wife vote here. And I'll be sure the rest of the summer residents allow one spouse to declare residency and vote here. And we'll be sure to vote NO on your local pet projects that don't benefit us. Edgartown is well managed town and the last thing we need is people trying to 'stir up the pot' unnecessarily. Remember, don't bite the hand that feeds you. You may want to keep the taxes higher for the time being to create a fund to hedge against future shortfalls. Seniors got shot in the foot this week. In 10 to 15 years there will be a senior explosion on the island with the senior population doubling. If they all go to sell their homes at the same time and there's nobody living here to afford it property taxes could go down leading to a budget short fall for a while. Then taxes could need to be increased to make up for it right when seniors are earning less after retirement. Further, with so few families living here year round to assist with senior infrastructure and senior related assistance that infrastructure and assistance could get quite expensive, leading for call for towns to step in. But with what money? Will seniors on fixed incomes raise their own taxes to pay for their needs? Things might get pretty interesting here soon. We may have missed a huge opportunity to have a more healthy and diverse economy on MV. Having a little lower taxes might not be such a great pay off, especially in the long run. This is a good article. However, the commenter, Mark, who doesn't give his full name, perhaps out of fear of criticism in town, is wrong. I am a homeowner, I pay property taxes, and I would GLADLY pay more in property taxes (which wouldn't necessarily happen) to assist in creating an environment conducive to real islanders having the opportunity to actually be able to afford to live here. Mark skips over the reality that these are our teachers, EMTs, nurses, those who work in restaurants and banks and doctor's offices and supermarkets. In short, those that support his life here, assuming Mark actually lives here. In America, "opportunity for all" must have meaning or we are falsely supporting a country and an island that has given up on the promise of fairness and equality. When an entry level house costs at least 500K, requiring a down payment of 100K and a large income to support a mortgage, all while raising kids or living on a retirees income, it is both cruel (or oblivious to actual island salaries) and shortsighted to prevent the growth of the island and continue to populate it with Islanders and not landlords and 2nd and 3rd homeowners. We live on an island together. If we all "have ours" but only look to our own wallets and forget what makes this island an actual community, we will have lost what is essential about living on Martha's Vineyard. As for the argument some make about "not everyone" being able to live on Martha's Vineyard if they can't afford it, I have one comment: the teacher of you child or grandchild or niece and nephew, or the PCA that takes care of you or the EMT that saves your life should NEVER have to commute over a boat (not to mention how so many forget that boat actually has "hours" and can't provide a steady commute for every profession!) our communiyt owes a moral obligation to a teacher of my child and yours the right to live here (not that living on the Cape is necessarily either!) or an EMT, etc. It is remarkable to think otherwise. In the event that happens "elsewhere" (off-island) that doesn't mean it's right and in this community - one community - we are much better than just looking out for ourselves. Now was not the time to approve the Housing Bank, but it deserves to be approved as the spirit of the town at town meeting clearly felt. It's Edgartown and we do the right thing. Taxes will stop going up when we stop spending on feel good projects. We are spending over $1.2 million to build a new hanger that is a pure feel good project. And this does not include the millions we lost in putting conservation restrictions on almost 100 acres of land so this hanger could be built. It amazes me that the Gazette reporter did not pick up on the bogus claim of the "Affordable" aspect being made by the Housing Bank supporters! Several people including the Counsel told voters this legislation has nothing at all to do with "Affordable". The word wasn't once mentioned in the legislation. Luckliy voters picked up on that. Here is an important takeaway from this meeting: 258 voters, if the article is correct, out of what? over 3000 registered voters? If you are registered to vote, did not vote, barring emergency situations, you have no complaint. This week a Lion of Edgartown, Mr. Ted Morgan, passed. He fought in W W II for, among other freedoms, the right to vote. Shame on us!